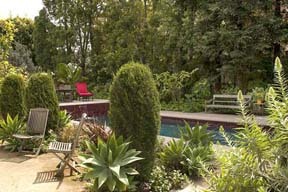 THE DARK AND COLORFUL landscape pops agains the deep burgundy and black Morrocan tile pool accent. The Windsor Square-Hancock Park Historical Society Los Angeles Garden Tour & Party April 27 paid homage to the plight of the vanishing honeybee. 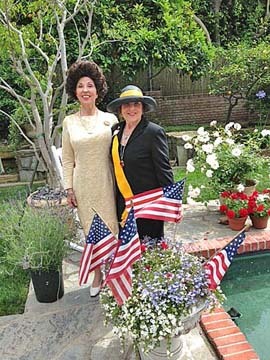 MRS. LADY BIRD JOHNSON, enacted by a historic researcher, with Lyn MacEwen Cohen. Gardens both large and small were represented on the ninth annual tour, which benefits a greening project at Los Angeles High School. 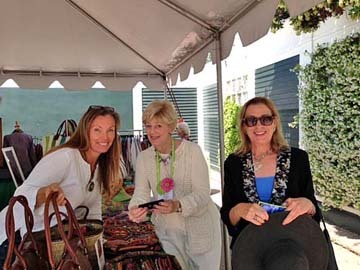 Co-chairs were Suz Landay, Fluff McLean and Mary E. Nichols. TOUR CO-CHAIR Fluff McLean with visitors. Planting a “bee friendly” garden was on the program at one home. A tour was led by Mrs. Lady Bird Johnson, enacted by a historic researcher. She showcased plants popular to bees, such as the flowering climbing pea. In addition was a “Bee in Our Bonnet” fashion show. 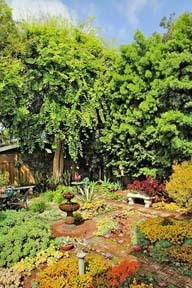 THE SUCCULENT GARDEN at the home of artist Amy Vansguard. A honey tasting as well as a talk, “The State of the Honeybee Today,” by Doug Fieri of the Southern California Beekeepers Association was also featured, as well as a fresh lemonade stand. 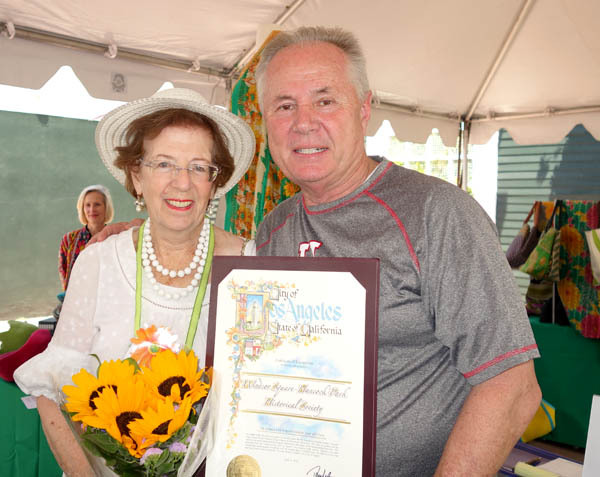 COUNCILMAN Tom LaBonge and Larchmont Chronicle publisher Jane Gilman.